As promised I am coming up with more details about the food workshop after being there and experiencing the exotic dishes presented in style by the chefs. As the event was connected to Blogadda, I went there with great hopes of meeting some fellow bloggers, but did not find anyone familiar over there. A bit of disappointment, as it is always a great experience to meet your virtual fellow bloggers and friends in real. What had attracted me to the workshop was my passion for trying out new recipes since the times I was in VHD Home Science College. The workshop promised to present us novel and ground breaking recipes that introduce genuine Indian food in a present-day international style with flamboyance. Our own Indian dishes were going to come out in all new avatars. I wanted to be there and learn the trick of styling the food which I love to do. As I entered the venue, it looked empty at first, but after a while Sagarika welcomed me with a huge smile and big hug. It was lovely meeting her after chatting a lot on facebook. After a bit of waiting the workshop began with the introduction from Sagarika followed by a short speech by Mr. Cheema, General Manager of Ista Bangalore, which was a brief look at the way cooking has been breaking barriers and making progress on styles and presentations. Michael Swamy took over from there. There were tips galore about food, styling, and particularly about Indian food. Some of the participants went ahead and asked questions or got their doubts cleared. Not being a food blogger or photographer, I did not have much to ask. I scored ‘0’ in that quiz. The right answers were Indonesia for both. Imagine that! Though I have been eating since the day I was born, I was very much ignorant about food. When Michael started cooking the ‘Organic tea cured slow roasted Chicken with roasted radish in spicy organic honey vanilla sauce’, I was expecting some great drama to take place; but surprisingly it was so simple and easy. The chicken was slowly roasted in the pan on medium flame. Lots of ingredients went into garnishing this dish, which included citrus orange juice, organic tea, cream, balsamic and chilli flakes which were used in reduction. I learned that we tend to overcook our food a lot. The style with which he presented the chicken was what made the dish something very special and extraordinary. Next he presented ‘Vegetables in a tomato Concasse’. Now again it was the way he served it which made it so special. The dish was a mix of colorful vegetables, roasted and served with something like a tomato sauce, served along with crackers. Michael Swamy used a ring mould to place the veggies in the centre of the plate, while he slowly poured the sauce around it. He was careful not remove the ring before the vegetables set in tightly. The pictures will tell you more about this. Even though I don’t want to be partial, I have to confess that the Aroma which emanated when Gautam Chaudhry started cooking was very enticing and made me hungry immediately. The dishes he prepared and the style of his presentation was great too. He was quick, simple and well prepared for the event. I want to take back my kids to Pink Poppadom so that they can get to experience and enjoy this great food, when I can afford it ;) as it was nearly a crime to enjoy those delicacies all alone without them. 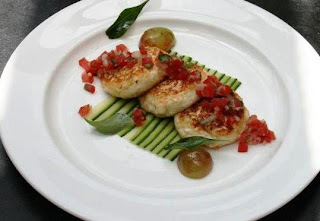 He prepared ‘Goat Cheese and Yoghurt Medallions’ which looked great. The dish was prepared using hung curd, goat cheese and cottage cheese. The salsa was prepared in the workshop to go with the kebabs. What surprised me was the use of roasted and ground chana dal to coat and hold the kebabs together. It had some simmering of Californian grapes in sugar syrup with curry leaves to flavor it as compliment. But according to me the most captivating and attractive of all the food in the workshop was the ‘Nilgiri Lamb Rack and Cannellini Beans’. As I mentioned earlier the aroma that came out of that dish was really very good to be true.He used something very new to me, a nilgiri paste to come up with great aromatic lamb shank. The process of marinating the lamb had to be cut short for the workshop, but we learned how to poke the lamb piece with a fork well, before rubbing it with marinating paste; which would allow it to absorb the spices properly. It was served with cannelloni beans and potato crispies. We were served with some snacks and given two written quizzes in the workshop. Though I felt a bit out of place with all food photographers, I had great time in the workshop. 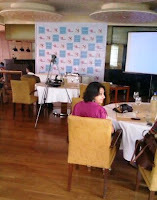 I learned a lot about present day cake baking from a blogger Priya, with whom I shared table. It was three hours of informative and fun filled afternoon, with Gautam, Michael ,and blogadda where we got many tips on culinary skills, details about food styling and food photography by the masters of the craft as we munched on the delicious tarts and sandwiches. The chefs had some great styling and presenting skills for food lovers. With the workshop coming to an end, we were waiting for our lunch to be served, while we discussed about food, I mentioned how I felt disgusted with fish after my marriage as that is what was consumed by my in-laws day in and day out and Priya said ‘that happens to her with Panneer. Call it the joke of the day, as we both were served with fish and Panneer LOL. The fish did not taste good either.. .. but the chicken made it up for the fish ;). Also the lamb which was followed was too yummy.. loved the taste and aroma of it. 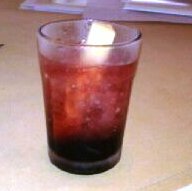 It was great lunch which also included a gola, but what stole the spotlight was the Paan Punch, it was just one of the best foods I have tasted. It has lots of flavor which were all subtle but made their presence felt. Chef Gautam deserves a loud applause for creating it. I was so lost in the taste that I forgot to photograph it. When it was time to bid adieu the organizers presented us with a gift hamper and voucher for two at Barbeque Nation, JP Nagar. Thank you blogadda for the wonderful experience. Such a well organized and tempting event. Seriously, even I would have failed in that quiz. 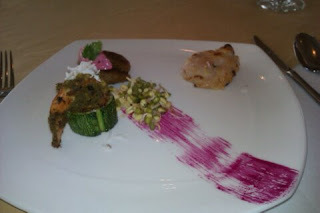 :P Indonesia...The beetroot paint was good, I will try it sometime, I add grated beetroot to salads for color. You have revived some fond memories...I have often visited Ista . The approach is bad but the place is lovely. Barbecue Nation at JP Nagar and Indira Nagar....both are nice places offering good value for money. I'm glad you had a great experience, Farida. I like your entertaining way of reporting. Yes, I too was surprised when Michael told us at the Mumbai workshop about the origin or idlis and dosas! Too bad about the fish and paneer though! An experience of a Lifetime ! Photos are stunning too ! Sounds like a wonderful event with some interesting events lined up for the food enthusiasts! Even I love learning different ways of presenting food and learning new recipes and if all this happens in such a friendly environment, its just an added bonus. As always your write up is excellent but what I loved more were your pictures since I haven't seen many clicked by you :) Very beautiful, as for the dishes, I loved the gola and the Mango Jamoon, very exotic.